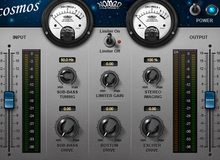 Today only, Waves offers its LoAir subharmonic generator for $29. For 48 hours, the Plugin Alliance offers special prices on four of its plugins by Lindell Audio, Brainworx and Noveltech. Waves offers three new 24-hour discounts this Sunday, with two plugins and one bundle at reduced prices. Waves offers its Maserati DRM Drum Slammer plugin for $29 today only. Today only, Waves offers a total two plugins and one bundle at special prices.